Waqf : Can Finterra Deliver The Changes Needed To Meet The Challenges? In simple term, waqf is defined as a voluntary, permanent and irrevocable dedication of a portion of one’s wealth for charitable aims. Arguably, it can also be identified as one of the most notable manifestation of Islamic philanthropy. Standing out as one of the greatest achievements of Islamic civilisation, waqf is a philanthropic foundation designed to maximise the value of endowments. But unfortunately for decades the administration of waqf assets has been a challenge in Islamic finance. Billions of dollars of waqf assets worldwide that could be used to alleviate poverty, are simply not being utilized efficiently (if at all). However, FINTERRA, an organisation dedicated to developing the next generation of blockchain sees a particular opportunity in waqf tremendous potentials. Especially today, with the advent of blockchain technology, it has brought renewed hopes and optimism to both waqf administrators and Shariah scholars dealing with waqf-related matters. Therefore, the next important question is: -how does FINTERRA intend to deliver the changes needed to develop waqf assets estimated at USD 1 trillion dollars and reinvent a system that has been in existence for nearly a thousand years? Specifically in keeping aligned to waqf principles and to a larger extent, Islamic finance, in terms of governance and regulations in order to remain relevant. FINTERRA Waqf Chain focuses on the evolution of blockchain as a technology, how smart contracts drive value and security on the blockchain and how these technologies are utilised for the development of waqf in the 21st century. The Waqf Chain model lays bare the roles of the Awqaf Board, the fund management, financial auditing, takaful, construction, asset management, and how best to automate these roles on blockchain. More importantly, through waqf chain, key challenges in waqf development such as capital raising can be addressed.. This is because in usual scenarios, raising capital to develop waqf lands might lead to considerable challenges as financial institution will not provide any form of unsecured funding to developers as the endowed land does not belong to any specific person/entity. 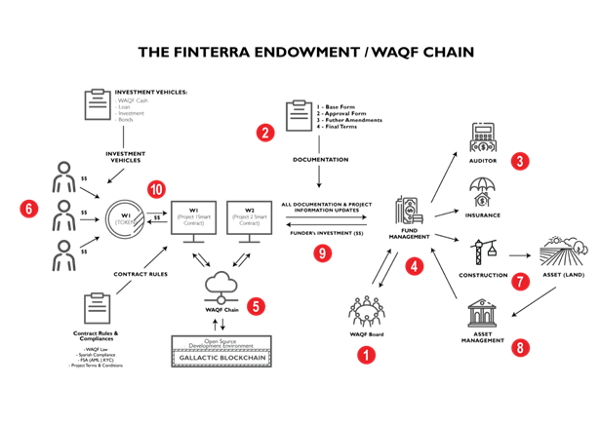 FINTERRA Waqf Chain aims to raise capital for approved projects via a crowd funding mechanism and the use of Islamic financial instruments such as cash waqf, Islamic credit, mudharabah and sukuk, built using smart contracts, and executed on FINTERRA’s GALLACTIC Blockchain. Through this method, it will help to address the challenges faced by waqf advisory boards and developers in delivering value and continuing revenue for the purpose that the waqf land was specified for. The following diagram show the various stakeholders and institutions involved in executing and delivering a waqf property project along with the flow of funding and project development. 1. The Waqf board identifies and makes available a land asset for development. 2. A development project paper is written that covers land title, feasibility study, building architecture, building project plan, project costing, project profit and loss, and recommended instruments of financing. 3. An independent auditor reviews and endorses the development project paper. 4. A licensed fund manager is then engaged to launch an ICO for the development of the specific waqf development project, via the sale of crypto tokens to pre-qualified investors globally. 5. The “Endowment / Waqf Chain” built on-top of the GALLACTIC Blockchain launches the tokens, against the required capital which needs to be raised. 7. Once the raised capital hard-cap is reached, the fund manager appoints a construction company to start the construction and develop a structure. .
8. Upon completion of construction, the fund manager appoints an asset manager to operate and maintain the asset. 9. Fund manager then collects any revenues or income generated by the asset. 10. Collected revenues or income earned is then shared with the investors based on the investment instrument used and the underlying terms and conditions. Finally, FINTERRA intends to provide a smart contract ecosystem and accompanying blockchain to allow waqf boards and other interested stakeholders the opportunity to submit project outlines / plans in order to fund and develop waqf properties.